Mike and I are off to a wedding today. The bride could not have ordered a more beautiful day...the sun is shining and there's no hint of rain! 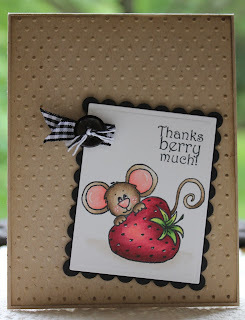 Of course I'm once again making a card at the last minute! Lately it seems I spend so much time checking out other blogs and looking through card galleries, that I don't get the cards made that I need! Anybody else have that problem? Inspirational Nugget: Time wasters...how easy it is to just fritter away the time. (Is that PA Dutch or what?) I can find all kinds of things to get caught up in so I don't ever get to the important things that need to get done: house cleaning, report cards, visiting a sick friend in the hospital, making that card that will bring encouragement to someone. And then when I'm up at 3:00 in the morning getting the important thing done, I wonder why I'm feeling tired! Oh Lord, help me to manage my time better! The Lord does have a solution to my problem...and yours, if you are a procrastinator like me. Ephesians 5:15-17 says, "So be very careful how you live. Do not live like those who are not wise, but live wisely. Use every chance you have for doing good, because these are evil times. So do not be foolish, but learn what the Lord wants you to do." We only get one chance at this life and it is but a mist. (James 4:14) So, Lord, forgive me for frittering away my time, and help me to use my time here on earth wisely. Creative Nugget: This is the wedding card I made for the wedding we attended today. Anne found this Plates and Napkins site for the Inspiration Challenge today at SCS. 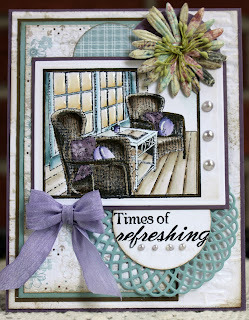 One of the blocks on this guest towel inspired the colors for my card. There is absolutely no stamping here...gasp! 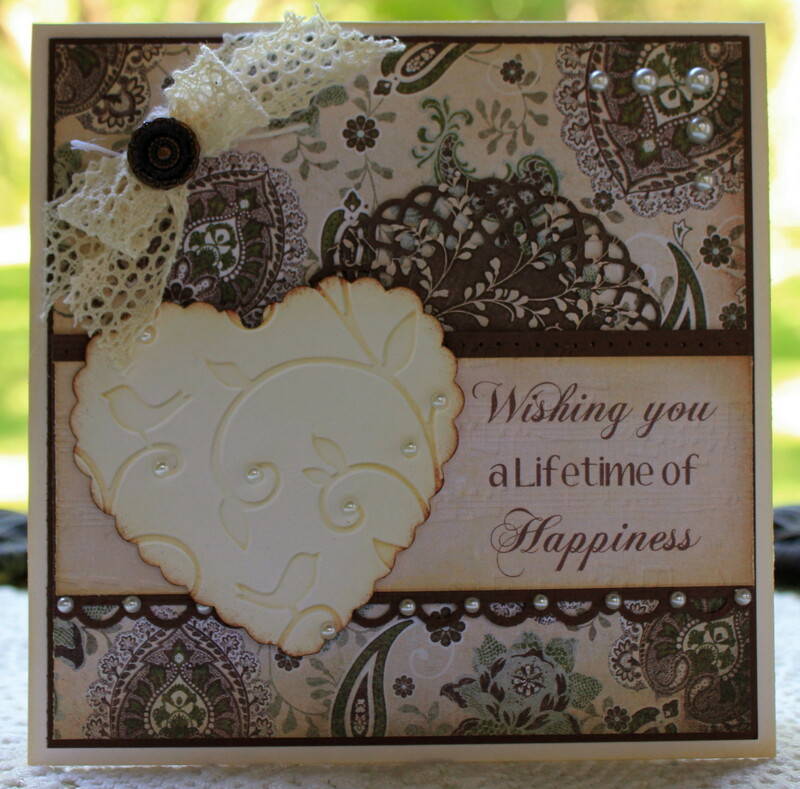 I used designer paper from the Capella paper pad by BasicGrey, a punched and embossed heart, the computer, a die cut doily, added some embellishments and one wedding card complete! Thanks for stopping by...have a wonderful Memorial weekend! Yesterday was a day of refreshing for me...a personal day...a day off...and we had beautiful weather to boot! Casey and I took to the fields for a long walk. Let me just say that dog owners who walk in public places should take responsibility for cleaning up after their dogs...if you know what I mean. If there's any "ahem...poop" around, Casey will find it... and...you guessed it. Needless to say, we had some cleaning up to do when we got home. Now he's all cleaned up and smelling good...he's just so sweet (just look at that face on my header)...and I love him no matter what! Inspirational Nugget: After Casey's walk I got to thinking about all the "poop" in the world today. Temptations abound...immorality, drugs, alcohol, pride, selfishness, gossip, bitterness, and the list goes on and on. Daily we must choose whether or not we will roll in life's "poop." When we do, we feel dirty and smelly. All of this filth in our lives affects our relationships with others. Thank goodness we can go to the Father to get cleaned up! "But if we confess our sins, he will forgive our sins, because we can trust God to do what is right. He will cleanse us from all the wrongs we have done," (1 John 1:9) God loves us...no matter what we've done. We can always go to Him. How refreshing! "He restores my soul..." (Psalm 23:3) So spend time with the Lord today and be refreshed! 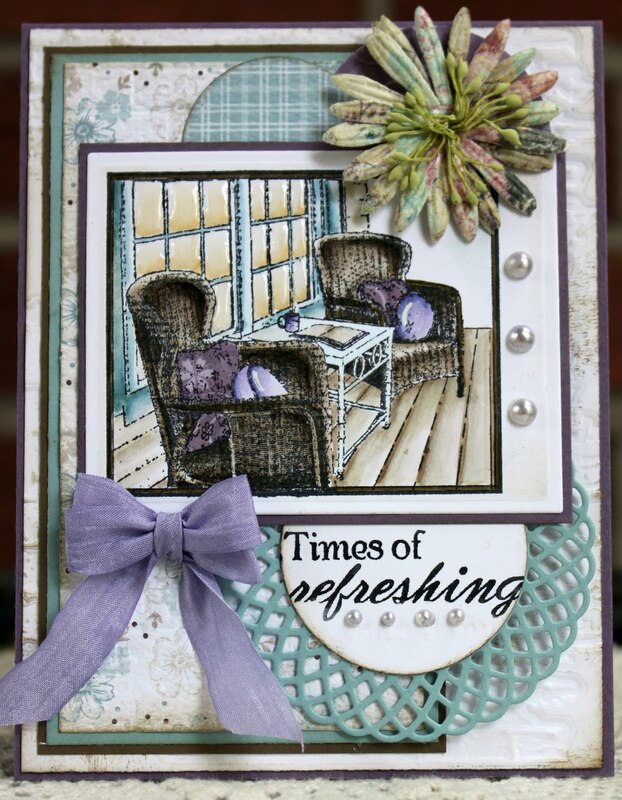 Creative Nugget: For my card today I used Splitcoaststampers sketch challenge 334 and color challenge 324, Baja Breeze, Soft Suede, and Perfect Plum. These are not colors I would have chosen, but I really like how they look together. The porch image is colored with Copic Markers. The pillows on the chairs are paper pieced and Glossy Accents were added to the windows. Thanks for stopping by today! After playing around with the layout of this blog for several weeks, I've finally decided to take the plunge and publish a post. You have to start somewhere...RIGHT! So even though I've a lot to learn about blogging, and this blog is not fully developed, here we go! Inspirational Nugget: This is the day the Lord has made so let us rejoice and be glad in it...and He has given us another day to enjoy. Because I am here writing this post and you are here to read it, I am assuming that the end of the world did not come as predicted. Man is fallible, but God's word is infallible. According to Mark 13:31 the earth and sky will be destroyed...but not yet. As we read further, "No one knows when that day or time will be, not the angels in heaven, not even the Son. Only the Father knows." There's a lesson to be learned here and Mark says it better than I could, "Be careful! Always be ready, because you do not know when that time will be." (Mark 13:33) We look forward to the return of Jesus, but until that time, I pray you live each day for Him! 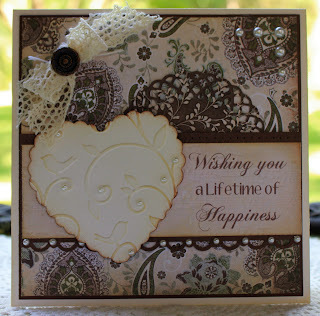 Creative Nugget: Today's featured stamper at Splitcoaststampers is Carly, AKA PaperInBloom. What a fabulous CAS gallery she has. I chose to case her Puppy Friend card. I kept the same basic layout on her card, but tilted the image panel, used the Swiss Dots embossing folder instead of stamping polka-dots on the background, and added an additional scalloped layer. The image is colored with Copic Markers and there's a little dab of Glossy Accents on Cocoa's eyes. Cocoa and I want to thank you for peeking in. Have a wonderful week!